Following a successful testing programme at Connel in Western Scotland, the first PLAT-I platform is being prepared for shipment to Nova Scotia, Canada. 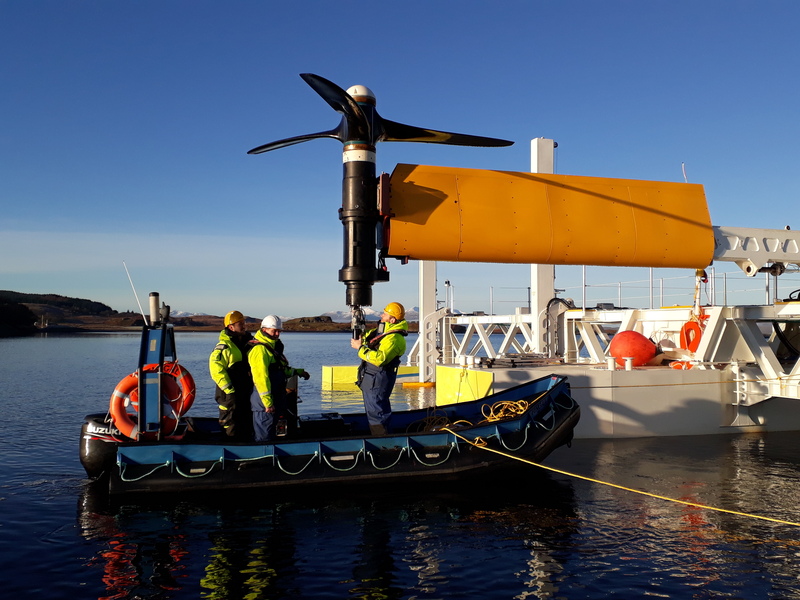 Sustainable Marine Energy’s (SME) PLAT-I tidal energy platform hosting four SCHOTTEL HYDRO SIT 250 turbines has successfully completed the first phase of its testing programme at Connel, on the West coast of Scotland. The Company is now preparing to ship the platform to Nova Scotia and install it for a second phase of testing. Having proven the installation, operation and performance aspects of the platform, this second phase of testing will concentrate on proving performance in the harsher climate of Canada while also conducting environmental monitoring, with the aim of assessing interactions of marine life with the platform. Black Rock Tidal Power Inc has applied to the Nova Scotia Department of Energy for permission to install the platform at Grand Passage for a minimum trial period of 3 months and, as part of that process, is currently engaging with stakeholders in the local area. The PLAT-I platform was designed with support from Innovate UK and DFID under the Energy Catalyst programme, with the build and testing receiving funding from Scottish Enterprise under the WATERS3 programme. The testing programme has successfully validated the platform and power generation technologies, with multiple platform motions and loads being measured. All systems performed as expected allowing the key advantages of the PLAT-I system to be proven. From the outset low cost assembly and marine operations have been a key design driver with both of these being demonstrated in the Connel testing programme. The modular nature of the platform, whilst making assembly on land easy with small cranes, has also allowed a number of components to be changed during the testing programme. Uniquely to the PLAT-I platform it has been possible to change out blades and work on the SCHOTTEL SIT generators in situ, with only small vessels required. "PLAT-I is graduating from Scotland to Canada, which is an important start to the export story for the Scottish Marine energy industry." SME is now teaming up with the Canadian company Black Rock Tidal Power Inc (BRTP) for this important follow on project, which will evaluate the environmental impact and commercial potential of the PLAT-I technology. BRTP is working closely with all of the relevant regulatory bodies in Nova Scotia and Canada to ensure that the Grand Passage deployment will increase scientific understanding of marine animal behaviour near the platform and provide a test bed for environmental monitoring systems. The results of the second phase of testing will provide regulators with more information to evaluate future tidal energy projects in the Bay of Fundy. Sustainable Oceans Applied Research Ltd. (SOAR) is a not for profit Nova Scotia company which has been engaged to assist BRTP and its partners in site characterisation, permitting and stakeholder engagement for the project. SOAR is also advising on development of an appropriate environmental monitoring programme for the Grand Passage deployment to look at a variety of marine life including sensitive whale species known to frequent the area. BRTP and SOAR are already interfacing with various research institutions and private companies to ensure that the most robust monitoring procedures are followed using the most suitable instrumentation, so that the programme is repeatable for future tidal installations in Canada. Back in Scotland, the PLAT-I platform is being prepared for shipping to Canada. The platform was towed away from the Connel Bridge site on the 7th of June by the 15m Meercat workboat “Venetia”, a confirmation of how the PLAT-I platform is lowering the bar in terms of the size of marine assets required to perform operations. Once alongside at Dunstaffnage Marina, the platform has been broken down into road transportable modules in less than a week and is expected to be Canada bound on a container ship by mid-July.